‘One Ted Falls out of Bed’ is a delightful book by Julia Donaldson. She is best known for her collaborations with illustrator Axel Scheffler resulting in books such as ‘The Gruffalo‘ and ‘Room on the Broom‘. In ‘One Ted Falls Out of Bed’ she has collaborated with a different illustrator – Anna Currey – and the result is that the ‘feel’ of the book is entirely different, although equally good! 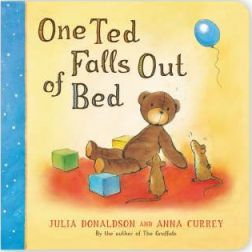 ‘One Ted Falls out of Bed‘ tells the charming story of a little teddy, who unfortunately one night, falls out of bed! This is hardly surprising given the title of the book! As this happens on the first page though, what the story is really about is what happens once he has fallen out of bed and his ensuing attempts to get back into bed! In fact quite a lot happens and he meets various toys. Every time something happens there is a cumulative effect which helps young children with their counting. For example, as soon as he falls out he tries to get back in and attract his owner only to discover that two eyes are tight shut! He is a bit upset until he is invited to play with three mice and they roar around in four fast cars! And so it goes on, up to nine, where he sees nine frogs playing tunes on different instruments. However, although this is all quite enjoyable, Ted really wants to be back in bed sleeping with his rightful owner. Therefore all the different numbers of toys he has met help him to build some stairs out of ten bricks! It looks like it’s all going to be successful until disaster strikes – the stairs tumble and all the different toys go flying! But luckily all the commotion disturbs the little bear’s owner who is sleeping in bed; two eyes open and a little hand reaches out and ‘one ted is back in bed’! This is the last line in the book and every one can heave a sigh of relief that it is a happy ending after all! I think this is a lovely story to share with little children. As with all the Julia Donaldson stories I have read, it is entirely written in rhyme which helps children with their phonological awareness skills. My daughter loves the rhyming element in the story and really enjoys trying to supply the rhyme. The other useful element in the book is that it helps children with their counting and numbers. On each page, there are different things to count, each time adding up to one more than the last. Then, about halfway through the book, the counting starts to go backwards going from ten down to one. My daughter really enjoys interacting with the pictures and counting the different objects or toys! This brings me on to the illustrations which are all really lovely! There is a light and airy feel about all of them which is slightly different to the collaborations with Axel Scheffler. All the toys are illustrated beautifully so they are all very attractive and appealing. There is a particularly delightful picture about halfway through when Ted is perched at the top of his stair of bricks before it all tumbles. Looking up from below are a number of the toys we have met previously all with terribly anxious looks on their faces! The last picture in the book is equally appealing too – with just the little boy’s and Ted’s faces peeping out from under the bedclothes, fast asleep! So overall this is another very entertaining and colourful children’s story book. I think that the simple story line will appeal to most children and also help them with their early reading and number skills as well which is a bonus! No Comments on "One Ted Falls out of Bed"